Coffee Roasting is the transformation processes of the chemical and physical properties of the green coffee beans. Roasting produces the characteristic flavour of the coffee by causing the green coffee beans to expand and to change in colour, taste, smell and density as desired by the roaster. 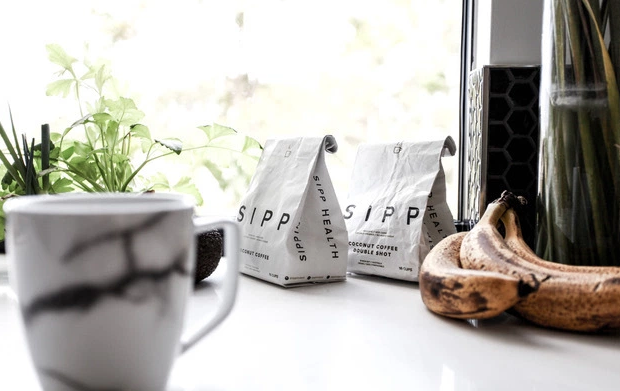 Unroasted coffee beans contain similar acids, protein and caffeine as those that have been roasted but the taste is completely different. After roasting the beans shrink almost 20% by weight and the aroma or flavour of the coffee is acquired. The purpose of roasting is to minimize the bitterness and acidity while maximizing the sweetness and aroma. Coffee beans are originally green in colour. With the temperature applied the colour begins to darken and the surface tends to become oily. The heat applied in the roasting process typically varies from 370 and 40 degree Fahrenheit (188 and 282 degree Celsius) and the time of roasting ranges from 3 to 30 minutes. The beans are then rapidly cooled. The times spent at various temperature levels greatly affect the flavour and colour of the roast. The roasted beans are then cooled and packaged for selling. Roasted beans can be considered fresh for up to one month. 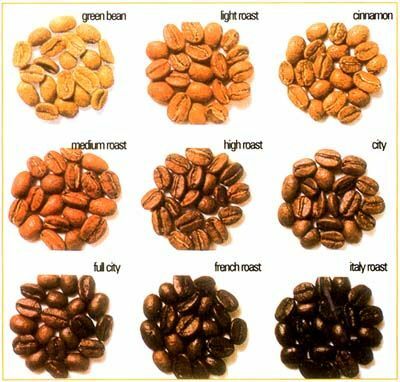 Depending on the heat applied and the change in colour the roasted beans are graded as light, cinnamon, medium, high, city, full city, Italian and French. The French grade is derived when the beans are double roasted, the bean sugar begins to carbonize and a Smokey-sweet flavour is achieved. In a typical roast situation the surface of the coffee bean becomes slightly shiny with a somewhat spicy flavour and in case of Double roast the surface becomes very oily with none of the inherent flavours of the bean is recognizable. There are other methods of roasting where heat is directly applied without the use of oil or water as a carrier. Coffee roasting produces smoke and fumes so it should be done in a well-ventilated area. Coffee beans can also be home roasted for personal consumption. This had been practiced for centuries and usually has numerous methods of roasting. Until World War I, it was more common to roast coffee at home than buying pre-roasted packets. In recent days, people are returning to home roasting coffee beans to enjoy the freshest taste and aroma possible. The coffee roasting process also determines the level of caffeine present in the coffee. The lighter and medium roasts of coffee have higher levels of caffeine than the darker roasts.